Believe it or not, Spring is here. Well, at least according to the calendar. There are signs of life all over, and lots of work being done to get ready for the season. (I heard the peepers for the first time last night!) The quiet season is almost over. In the 1800s, downtown Nantucket would have been anything but quiet, even in winter. The waterfront bustled with whaling and merchant ships, but other parts of town saw different industries, both of which relied on the labor of island women. Courtesy of the Nantucket Historical Association. Down a narrow side street off Petticoat Row (modern day Centre Street) sat the Atlantic Silk Company. From 1835 to 1844, 10-12 Gay Street produced woven silk products like silk vesting and handkerchiefs. Many women were employed in the production of silks, and the factory held the second power silk loom ever put into operation in the world. Silk was a deliberate choice, as the material was preferred by Quakers to cotton that was picked and processed by enslaved people. However, the mulberry trees planted to feed the silk worms did not flourish in Nantucket’s wet and cool climate. After the factory shuttered, the building was converted into a duplex. The 10 Gay Street side has been used as a lodging house and inn since 1870 and is today the Sherburne Inn. Nantucket women also worked in the production of straw hats and mats from 1854 to 1858. At its height, the plant employed between 200 and 300 Nantucket women. The island’s rapid economic decline at the end of the whaling industry contributed to the shuttering of the factory. The straw company’s first location was present-day 76 Main Street. The building was originally Hicksite Quaker Meeting House, built in 1829. Hicksite Quakers were the most liberal members of the sect, and by 1840 disbanded as most had become Universalists. The building was home to a boatbuilder until the straw factory purchased it in 1853. After the straw company moved out, it became a warehouse. It was moved to Brant Point in the early 1880s and became part of The Nantucket Hotel. 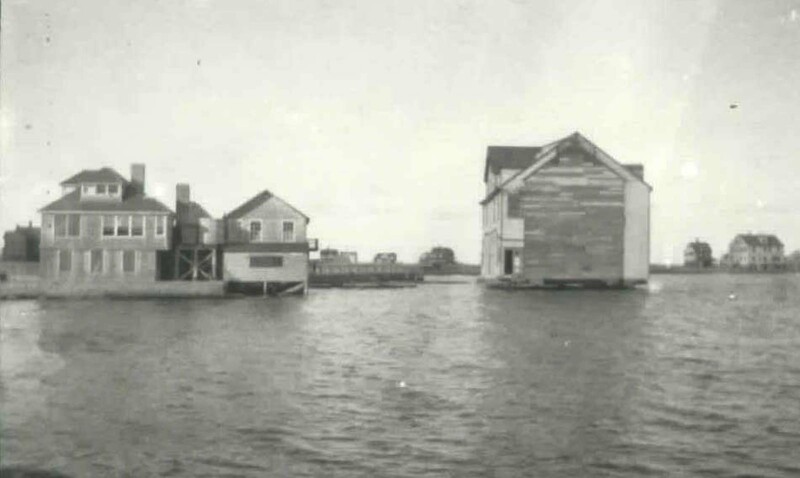 When the hotel went into decline, the structure was put on a barge and moved across the harbor to what is now 17 South Water Street, where it became a silent movie house. Today, 17 South Water Street is home to the re-built Dreamland Theatre.